After my latest map release, I decided to take a look back at the very first map I published – superrj1r, all the way back in 2005. I thought it would be good to give it another playthrough and to take another look at it from another perspective – as a more experienced mapper and player to see how far I’ve progressed over the past six years. I started working on this map in July 2005, when the original Zap was still up and running. I had looked through many rocketjump maps and found myself wanting to design my own, and not as insane as some of the offerings on the server. I downloaded Worldcraft 1.6, Quark, and a few other editors that were around to find one that I liked. I decided on Worldcraft 1.6, and then got busy designing a few jumps on paper. Superrj1r was uploaded to Zap on August 2, 2005 (I believe by Spamlite). I fired up a local server and loaded up superrj1r. Almost immediately, I notice the real lack of texture variation and detail, along with bland lighting. All the ents work correctly, and there is a progression of difficulty as you play through the levels. I start thinking about if how I made this map today, what I would have changed, where I would add detail, trim, light sources, and other eye-candy. I easily pass the first level, with three quick successive rocketjumps up to the teleporter cube on the other side. I enter the second level, a water-rocketjump up to a platform. I notice texture misalignments, and how the water in this box is actually 3 different brushes. I find the jump much easier now than I did so long ago, and pass onto the third level. This level requires a rocket+grenade jump combo. 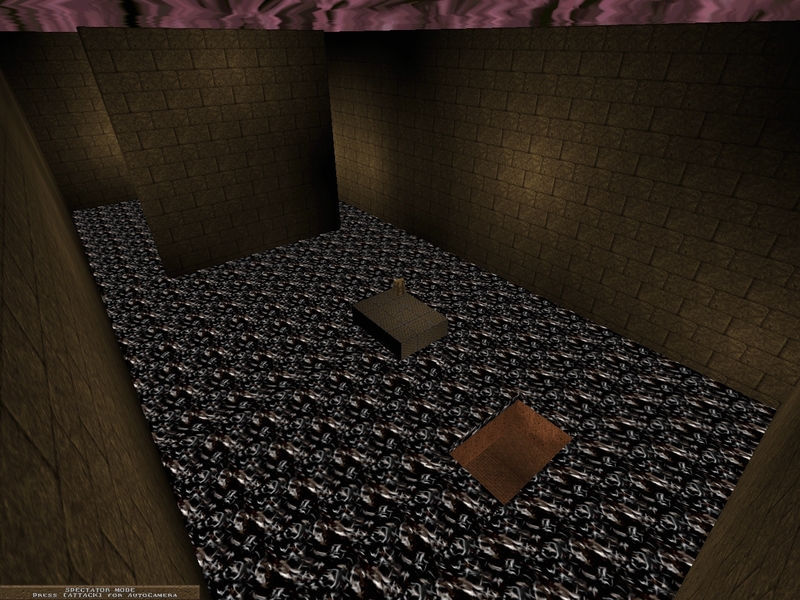 The mapper side of me notices the basic architecture, while the player side of me concentrates on the jump. I wonder how many people (who aren’t mappers) actually have a care about detail on TF maps. Would they be as happy if the maps were bare cubes and fullbright (and there are fullbright maps), or does their foremost concern after the layout regard the lighting of a map? I’m now on the stange that used to give me fits back in 2005. A double rocketjump off a wall is required to loop around to the upper platform. So far, a positive I have noticed about this map is the wide variety of jumps. There have not been two stages even remotely similar, and from what I remember the final two levels are radically different too. However, today I easily pass the test, and I am teleported to the fifth stage. Stage 5 is where I first notice some more interesting architecture. There are multiple rooms in a stage, with obstacles to grenade or rocketjump through or around. The textures on this stage match moreso than the earlier stages, even though they are once again limited in selection. I grenade jump up and rocketjump off the side wall out over the floor and land on the platform on my second try. I see I have a choice which direction I can use to make it to the next platform, and I rocketjump right. 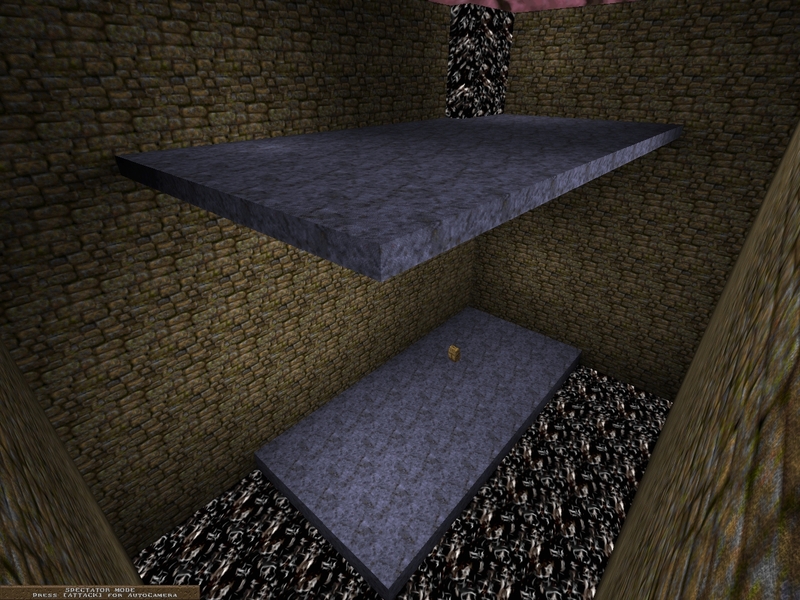 The teleporter is above me, with the sky immediately above it, and a platform reaching out to block my path. All the while, I’m contemplating what I could do to just make the stage “better.” I’m talking about that “x” factor, which seperates the bad from the mediocre, the mediocre from the good, and the good from the great. I complete the jump, scoring five frags and receiving a rewarding “super beat the basic course!” message. I am now given a choice in which of the final two levels I would like to try and tackle, either the “hard” or the “nightmare” according to the teleporter. Since this is my first playthough in at least two years, I choose the “hard” course. I immediately see a platform in front of me, but I must jump through a hole in the wall. On my first three tries, I am teleported back to the start since I touched the wall. Clever, I thought. I ended up shooting a second rocket at the base of the wall as I fly towards it, giving me the extra boost I needed to clear the evil teleporting wall. There is a pack on the new platform, giving me a grenade to use. I grenade jump up, spinning and passing through the passage in the ceiling. The next jump is a 180 degree u-turn around a wall. I miss the platform the first time, since I was trying to find its location as I turned the wall, and I overshot it. I try again and soon defeat the level, scoring more frags and another congratulatory message, along with a console message mocking me to attempt the nightmare skill. I realize now that having a blind corner, with no message telling the player what to do or expect, is a big error on my part. Score one for the wiser me. I replay the map, wondering why I didn’t have the option after the “hard” level to teleport immediately to the nightmare level. I defeat the course and enter the nightmare level this time. 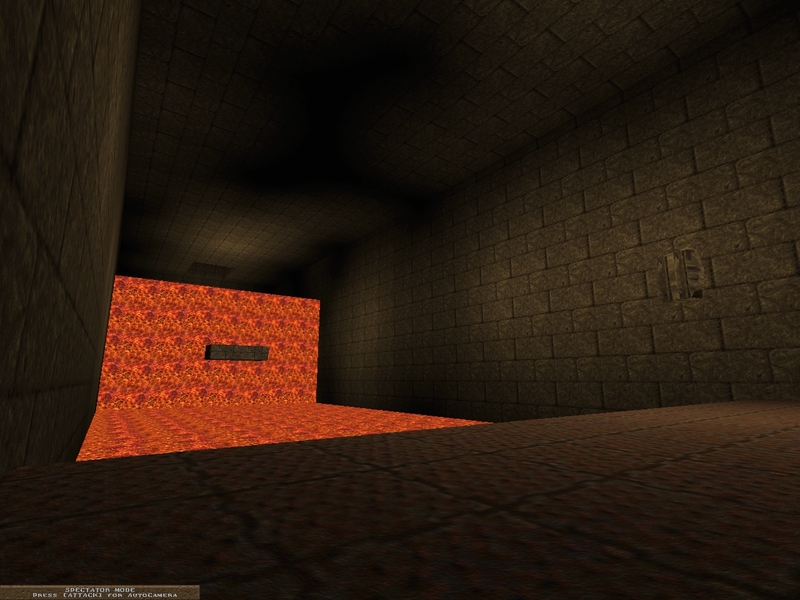 I am greeted with a huge wall of lava blocking my path. I double rocketjump to the platform in front of the lava, and then rocketjump over it and land on a resupply pack. So far, I’m finding this level much easier than I expected. I rocketjump up, stopping in an alcove before finally reaching a small sqaure to stand on. There looks to be a small entry in the lava ahead, but I can’t tell for sure. I make a low rocketjump, and rocketjump off the side of the passage in front of me to propel myself backwards onto a platform. I silently thank myself for remembering that part. I make another low rocketjump, followed by another very flat rocketjump and land in the teleporter, which I noticed had walls around it, blocking any player from winning if their jump was too high/low/sideways. I look back and remember playing my map for the first time, and trying my best to fine-tune it before a release. I think I was the only real tester of the map, so it was built closely to jumps I could complete. I also remember the elation the first time the map was voted up I saw other people play my map on Zap and give me feedback. I couldn’t believe that other players were taking time to play my map! I remember the players on the server at the time – Nate, Spamlite, Eoa, and I. Ted played my map soon after upon hearing there was a new rocketjump course. 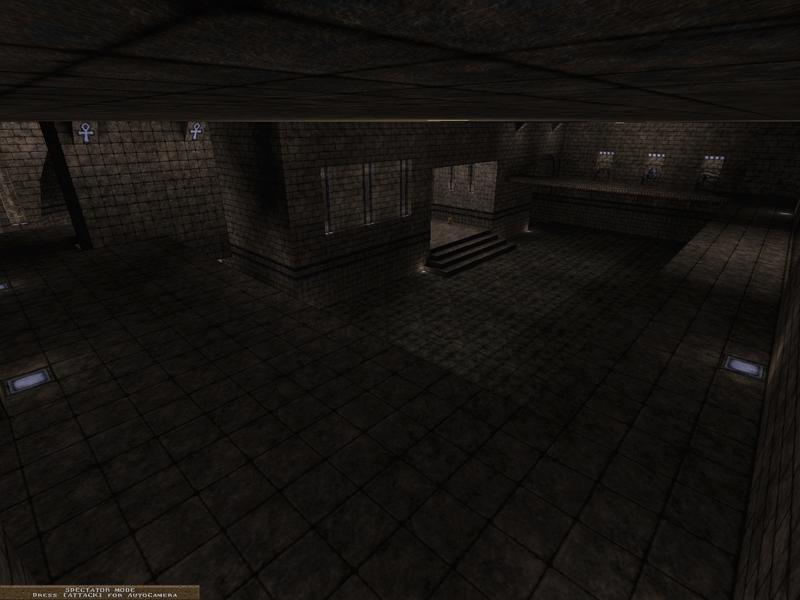 It was a great feeling having my map, that I designed and created, played on a public Quake server. It is still a great feeling to have a map you designed and built voted up for the next map to be played. I’m flattered that Egypt3 has received so much attention and praise these past days. As with every map, I vow to myself that my next map will have better gameplay, better detail, better lighting, and an overall better design with that “x” factor that every good map seems to have. It was exciting to revisit my first map from six years ago – to see its positives and its negatives in a different light than I would have at the time of its release. I can how I’ve improved over the years. I know when I was building superrj1r that I was doing my best to make a good map, trying to reach my mapping standards back in 2005. 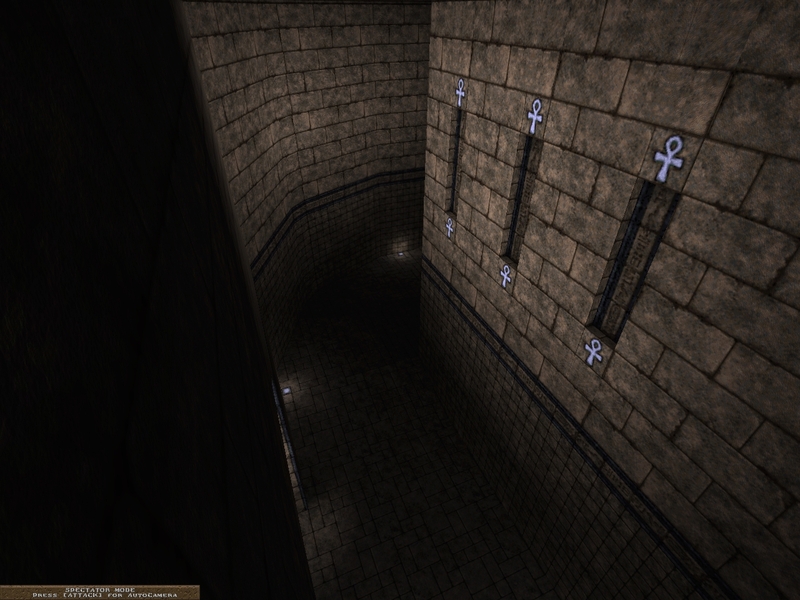 Superrj1r was my first real exploration into mapping, and Egypt3 has been my most recent. I did not know all the tricks I do now, and I did not know what was physically possible or impossible, as I do now. I did not study maps as I do now, and I did not have the patience that I do now. With time comes experience, and after maturing and constantly examining other maps (both TF and all the newest singleplayer releases), I always hope that I can build a level to my current mapping standards, no matter how high I might feel they are. Just a quick update before I head out for the night. Egypt3 was played tonight on the Tastyspleen MTF server, and I’m happy to report that it was a success. No one had any trouble connecting/downloading/ or learning the map layout, and it provided for a fast-paced game of TF for 30 minutes. 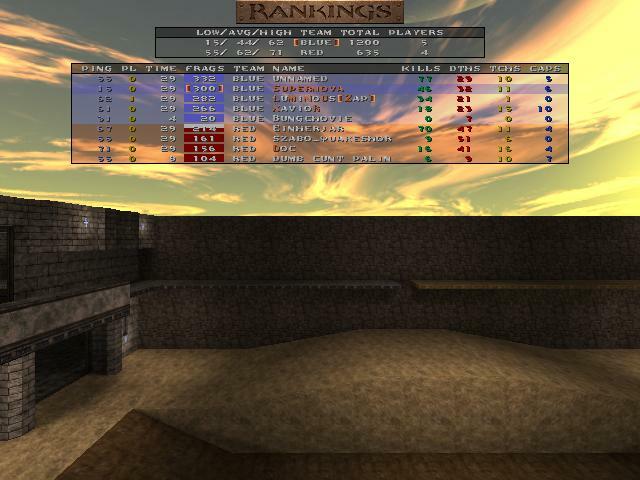 Blue won the round 25 to 15, and there was an average of 10-12 players during the game. As designed and expected, the map was more favorable to the offense. I’ve always found maps based on offense to be more fun than defensive-minded maps. There wasn’t much defense at all for the first 10-15 minutes of the map, and the offenses traded caps. Once the players settled in, and 2-3 people became dedicated defenders, the caps were slowed but not stopped. I had a great time playing this map, and I look forward to playing it again (and I hope other players feel the same way! ), especially now that people have a better feel for the map and can organize a defense. I’m also releasing two related files for MTF. The first is a .loc file for my most recent map, Egypt3. (Thanks for the suggestion, Ein!). If you don’t know, a .loc file can be used for reporting locations on a map – much faster than typing them out yourself. After you have downloaded the loc file, you can place it in fortress/locs, id1/locs, or ezquake/locs (depending on your client). Ensure that you have tp_loadlocs set to 1 so the file will be loaded at the same time the map is. Locs can also be used in conjunction with teamplay scripts – I’ve written a basic one already. A teamplay script automatically reports your location/health/armor/etc when you trigger certain events, as in picking up or dropping the flag. In the basic config I just linked to, place it in your quake/id1 directory, and then after you join a TF server, type “/exec testloc.txt” in the console (no quotes). When you pick up or drop the flag, you will tell your team the location automatically. If you wish to disable the script ingame, simply type /set tloc 0 in the console. updated about a year ago, and changed (or added) the 6-8 messages that have been modified over the past year. This fragfile should have just about every death/cap/suicide/flag/frag message from any version of MTF in the past 10 years. [6/22/11 @ 3pm CST] – Happy Birthday Quake; Egypt3 Released! Egypt3 is finished! 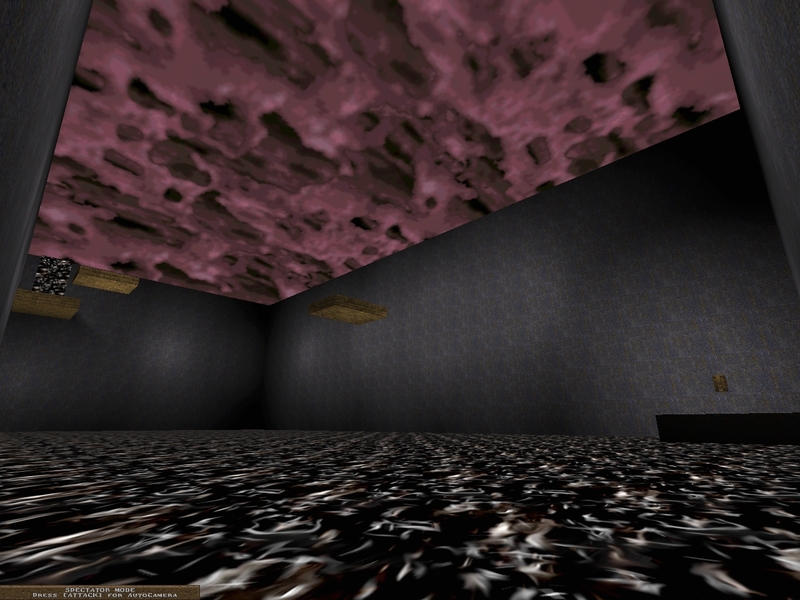 In honor of Quake’s 15th birthday, I am releasing my newest TF map. 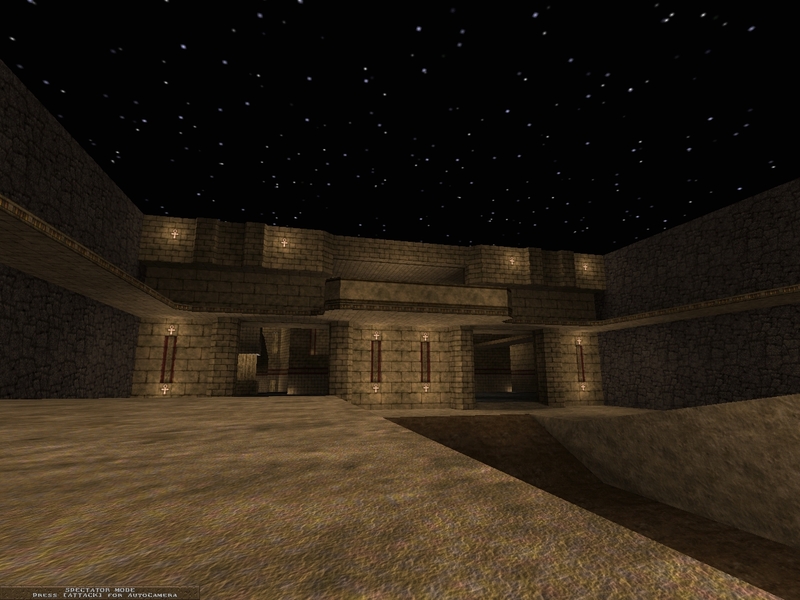 Egypt3 is a smaller map deisgned for 6-10 players and fast-paced gameplay. The flagroom in this map was a design I’d sketched on paper a few months ago, but it wasn’t until the last two weeks that I had that “eureka!” moment and seen how to effectively integrate it into a full TF map. I wanted to originally use a different texture set for this map other than a standard base/metal/egyptian theme, and I briefly considered using a graphics wad by Kinn or metlslime’s Rubicon.wad. However, I have worked with the Sock’s Egyptian set before (most notably in superrj2r), and it is a set of graphics that I’m comfortable using. Also, I’ve always been a fan of egypt2.bsp, especially because of its aesthetics. 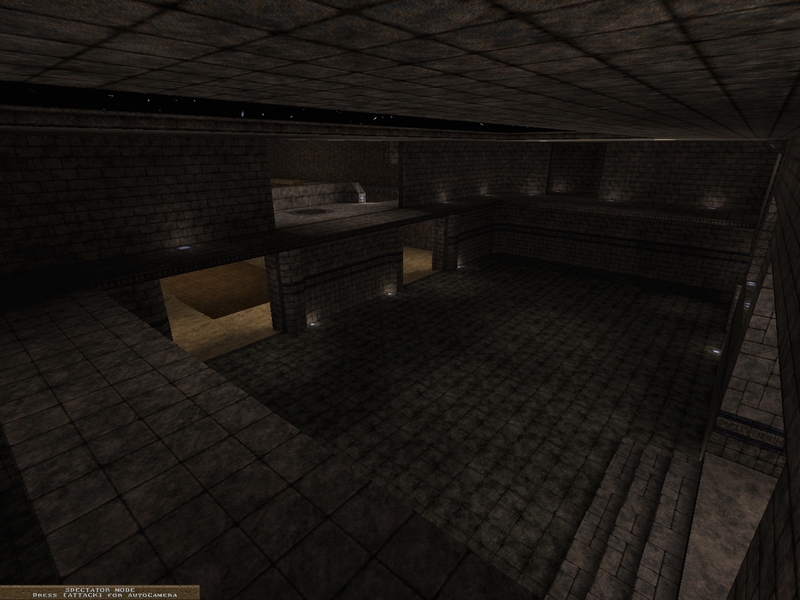 Once the layout was done, my main goal was to concentrate on the lighting of the map. Compared to most singleplayer releases, most TF maps only have basic lighting, and tend to rely on minlight. Once again, I did not use minlight, and I had basic lighting down. My next step was to download CZG’s unfinished maps and the newly relased sources to Rubicon 2. I’ve played many of their releases (often several times), and I’ve always admired the quality of lighting in their maps. In Egypt3, I used many different light styles depending on the source, and I experimented with the fade distance/attenuation/etc to get a look I liked. Some people might say that detail and lighting don’t really matter in a TF map, but I feel otherwise. I want players to get the feeling that the author really cared about the map and did more than the bare minimum of work to get the map released. With all that said, check through the brief gallery of the map, and I hope you TF players out there enjoy this map as much as I did creating it. [6/16/11 @ 8pm CST] – Introduction and getting the booth online. I’m Super on the NA MTF Quake scene. I play on the Tastyspleen MTF server located at 74.86.171.201:27502 and operated by XavioR (also known as avirox to some of you). I’ve played Quake for around a decade now (you know you’ve played too long when you can’t remember when you started..), mostly MegaTF but I’ve also enjoyed playing the occasional match in Clan Arena and the rare game of DM/TDM. drop to the wayside over the last year. don’t think I’m at that “level” yet, and its still fun creating new worlds for TF after many years. My last booth during Qexpo 2008 was here, and its primary purpose was to advertise my MTF Midair mod. While a good success from 2006 through 2010, I believe its time has come to pass on. Its only update after QExpo2008 was in 2010. I just don’t have a major drive to work on a mod (which, I feel, is as good as it will get feature and gameplay wise), and to also continue working on maps. Maybe someday I’ll return to Midair, or turn it over to one of the players. I don’t know what the future holds. Stay tuned for more updates throughout QExpo 2011!